« Don’t You Hate Waking Up to a Lange Monkey That Could Easily Kill You Trying To Open Your Door? I’d like to start by saying sorry for posting the same thing twice. I’m bad at computers. So it has been three weeks already! I already have had so many crazy experiences! Today was Liza’s day off, Muriel and Yvonne (the people in charge) were sick, and the one other volunteer was sick too. I had to take care of 56 creatures all by myself! We have 1 Rainbow Boa, 1 Guatusa, 2 Coatís, 3 Spider Monkeys, 4 Squirrel Monkeys, 7 Birds, 7 Capuchin Monkeys, 8 Dogs, 10 Tortoises, 13 Wolly Monkies, and, not to mention, the 15 or so wild Tamerins that come to steal food. Talk about a handful! Then yesterday the tortoises escaped! We were walking along a trail in the jungle, and we saw one then we walked back to the cage and 5 snuck out of a hole they dug under the fence. We have still only found 3! Then Monday I saw a snake oustide getting teased by a monkey. It was red, black, and white so I immediately assumed the worst and grabbed the monkey away. 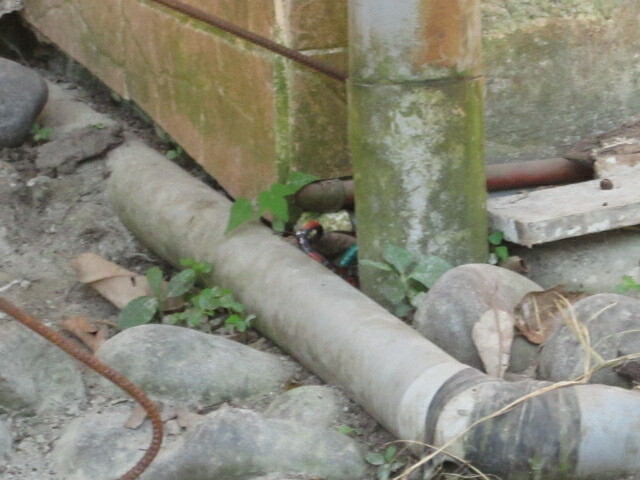 When I did this the snake hid in a crevace under the house so I googled “South American Coral Snakes” and sure enough that’s what it was (Coral Snakes are deadly but very shy). I was the only guy at the house so I grabbed these metal rods Yvonne has for the Boa and brought the snake into the jungle. These are just a few stories, but something like this happens every day. The monkeys are also very annoying. Today I made a garden to plant plants where tourists had killed all of the plants. Imagine my horror half an hour later when all of the plants were uprooted. They weren’t torn or anything. They were just nicely dug up and laying there on the ground. The other problem with the monkeys (not really with the monkeys but with people) is that tour guides bring tourists here and promise them pictures with monkeys. The monkeys are wild animals, not people in costumes or domestic pets. Many years ago the monkeys were either babies or malnourished so it was okay to play with all of them. Now they’re grown and healthy. The Spider Monkeys could kill a person (which is why only one is free), but the others will bite if you try to grab them. Then if they get bit and scream, the monkeys see it as a threat and would all gang up on the person. Nothing bad has happened and hopefully it stays that way! So its been three weeks and I still get homesick every now and again, but I’m doing pretty well. We weren’t eating much for dinner for a while because we didn’t think they would supply it so we either ate bread or went into town to eat. Then we asked if we bought food to cook dinner if we could keep it in the fridge, and they said they’d buy the food for us! So we weren’t eating for no reason! This place is also all about attitude! 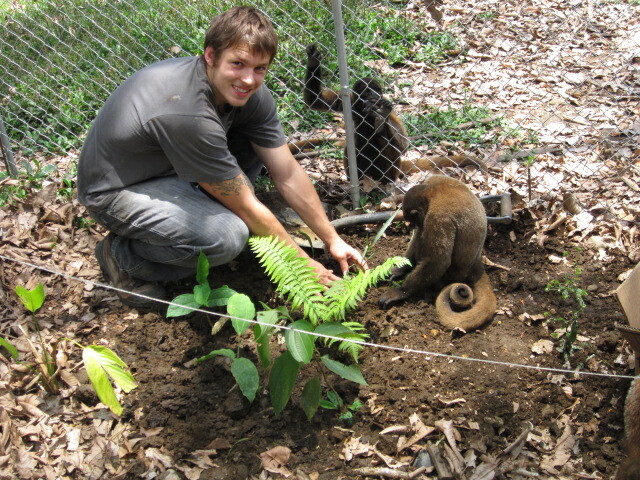 Some days I say, “Wow, I’m living in the jungle with real live monkeys, and its so amazing. Plus I get two delicious meals a day cooked for me, and I can even use the internet at night.” And other days I say, “I wish there were fewer bats living in my room, monkeys didn’t wreck everything I make, I could take a hot shower, and everything wasn’t covered in poop.” I have some good days and some bad days, just like before my trip. I was looking at pictures from before my trip and saw 300 blurry pictures of monkeys at the zoo. Now I have monkeys on my back everytime I try to do something (try carrying groceries in with monkeys everywhere). We have also gotten used to Puyo. We have our internet cafe with nice computers and a really good juice place! There’s a big freezer full of fresh fruit and you get to pick them for 50 cents per fruit. Ecuador isn’t like a border town in Mexico though, nobody here speaks any English so I always have to speak Spanish. Okay I’m sure I’ll realise I forgot something in a couple minutes, but I think that’s all! That’s true! And I complaned about it at home too! Are you talking about letting the snake go instead of killing it? Because it is an animal sanctuary I live at, and generally killing animals is frowned upon here. You’re like the fricken monkey whisperer!!! I have Skype now, so we gotta set up a time! Meanjeanjmo is my contact name. Miss u boy!!!! have you ate any bazarre foods yet? See that’s what I said to myself too. I thought it was a fake by the same rhyme thing (there aren’t many snakes in Mn so I have to settle for reading about them instead). Then afterwards I looked it up and I saw a picture of a South American Coral Snake that went red, black, white, black, white, black, red, and that’s what I saw. It could have just been a bad picture I saw online. I’m just glad it didn’t bite me so it can remain a mystery!